HAPPY BREAST BALM - I was kindly sent this product by a lovely lady I met through social media. I had never heard of it before and was really intrigued, but I never imagined it to be as amazing as it is. Happy Breast Balm is basically an oil that you rub on your breasts, it helps activate your lymphatic system (and for someone who's had 22 lymph nodes removed, that's a huge bonus) and also reminds you to check your breasts and 'get-to-know' them which is a great thing, you'll notice straight away if there's any changes or any unusual lumps and bumps and as we know, early detection in breast cancer is your greatest chance of beating it and saving your life. This oil came with a dry brush and basically you use the dry brush first and then apply the oil afterwards. I had been having chronic nerve pain all over my mastectomy and drain site. It was so bad for over two weeks that I thought I was going to have to get a prescription for some kind of nerve drug which I really didn't want to do. After using this oil only a few times, I have had such an improvement in the nerve pain that I think I'll be okay. I can't even explain how down I was because of this pain and it's such a huge relief that the pain is starting to subside and crucial for my overall feeling of health and wellbeing. Also it's nice to have a little ritual where you stop what you're doing and be in the moment and do a little bit of self care. I usually put the oil on my arms and hands too (I also have a lot of nerve pain there ;-/ ) and then do a little manicure as well. It smells great too and invokes all those lovely feelings of when you go for a massage. I had been wanting some teeth whitener for a long time but kept forgetting about it and never purchased anything because I knew I would need to research it a lot and I didn't want anything too harsh with too many chemicals in. I was in Mooloolaba the other day and found this little organic wholefoods shop and it stocked some beauty products. They had a teeth whitener paste but it was $40 and this toothpaste also claimed to be whitening so I thought I'd try this first as it was only $20. It's sooo weird as it's made from activated charcoal and benzonite clay. So it's black! When you first put it on your teeth it looks hideous. It tastes pretty rank too, I hate cinnamon and it is made has cinnamon clove in it BUT I have only been using it for a week and I definitely think my teeth are whiter as a result and my teeth and my mouth feel really fresh and clean after using it. So I think I'm definitely going to order the whitening paste when this toothpaste runs out. As I've got older and also since I've had cancer, I've been really conscious about sitting in the sun. When I was younger and like most Brits, I would sunbathe the whole damn day when the sun was out. I'd get two weeks in Spain every year and fry myself like a crisp. When I first moved to Australia I was constantly topping up my tan. But now when the opportunity of sunbathing comes along, all I can think of is skin cancer and wrinkles. I like to look brown, like the rest of us but most fake tans, even the more natural ones can have some horrible ingredients, that I don't want anywhere near me. I recently found this gradual fake tan cream from Moogoo and I am obsessed with it. There's nothing harmful in here and I have been using Moogoo products for a long time (I also really recommend their sunscreen) they are a company I really love and really trust. So when I discovered this I had to try it. It started working after the first application, I looked a lot more tanned the next day and I wasn't expecting to see a result from it that quickly. I wasn't too precious about rubbing it in and found that even with my slap-dash approach there were no streaks and he colour was really lovely and really natural looking. This deodorant is also from moogoo and I bought it at the same time as the fake tan. Here's a fun fact for you..I only wear doedorant under one arm. Because I have no lymph nodes under my left arm, I no longer sweat under there, my body just can't! So I only need to use it under my right arm. I am VERY careful with my deodorants, because usually they are loaded with toxins and parabens and parabens are closely related to breast cancer. They travel straight through your lymphatic system and if there's one place you don't want parabens, it's there. So I have been using this for about a week and even in this almost 40 degree heat it covers up any odours, it's really soft on your skin and of course, it has no unwanted, nasty ingredients. 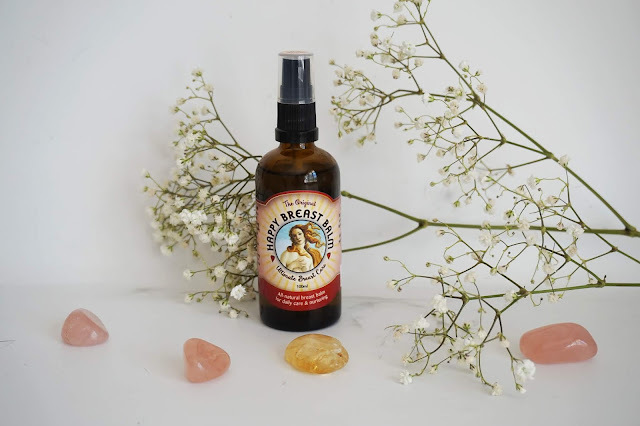 I had been using a great natural tea tree deodorant which was great at it's job but was very stingy and irritated the skin under my arms a lot. I'll definitely be sticking with moogoo deodorant as my go-to deodorant. It's so important to find a good one over here in Australia with the year round heat. I am honestly so obsessed with moogoo right now I can't wait to go on a little splurge and stock up on all the other products I haven't tried before.